It’s 6 a.m. when my alarm clock sounds and despite it being dark outside I have no problem rising this morning as I have been looking forward to this day trip all week. After a quick shower, cup of tea and double checking I have charged batteries, CF cards, monopod, camera and lens we are on our way to do some photographing in Richmond Park. 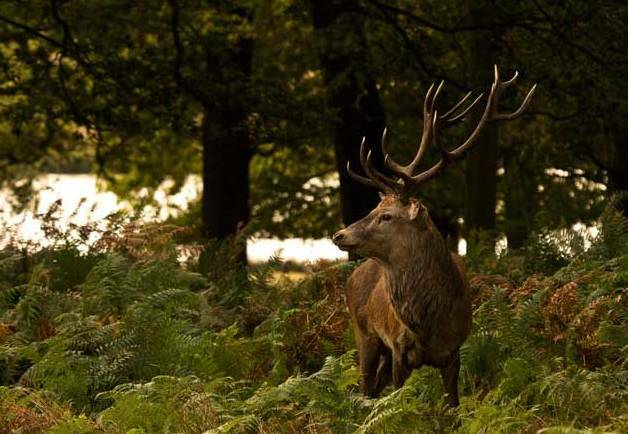 Richmond Park is a 944 hectare urban park located in south west London and is the largest of the royal parks in London. The park is home to numerous wildlife species including red and fallow deer, foxes, rabbits, ring necked parrots, kestrels, woodpeckers and numerous waterfowl species. Our main aim for the day was to photograph red deer. 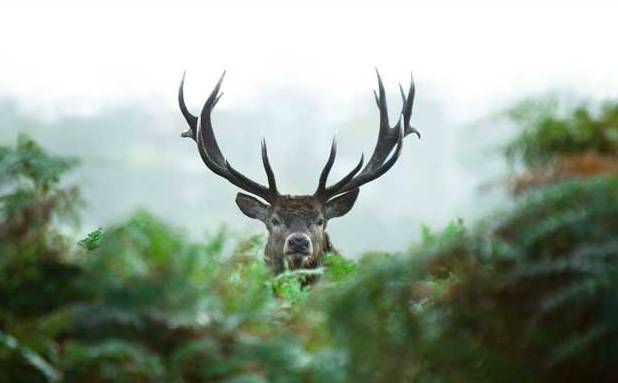 In autumn the deer start their breeding ritual called the rut, where mature stags compete for the attention of the females (known as hinds) by sparring with each other. 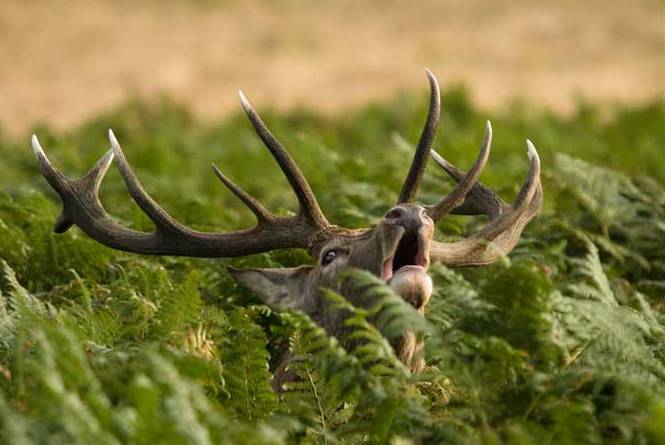 Sometimes fights can last several minutes and males can sustain serious injuries if nether stag backs down. 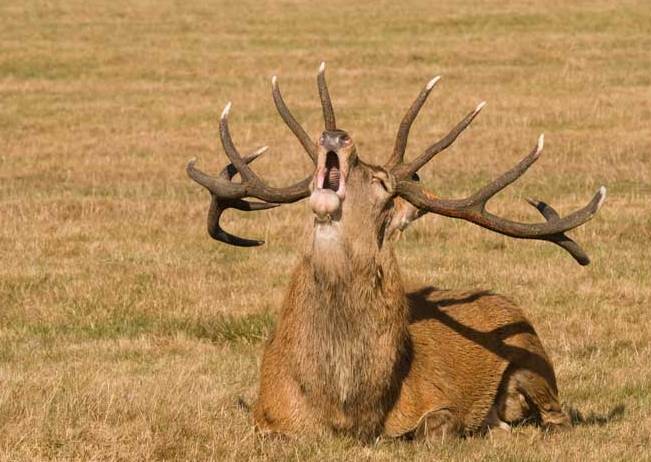 Stags can be heard roaring and bellowing to advertise to females or to keep a check on the females already in his harem or group. It seems that the females are attracted to males that call the loudest and most frequent. Arriving at the park we met up with a friend and discussed where we would start our deer search. All of a sudden out of the morning mist came a low rumbling roar, similar to that of a male lion that I am so accustomed to back in Africa. We all froze and listened with excitement as the realisation that there where deer in the vicinity became apparent. Discussion over, we headed for the distant roars of a stag advertising to females in a nearby woodland patch. We found a fairly large group of around 15 deer grazing on chestnuts that had fallen overnight. They where all a bit skittish and due to the low light in the wood we could not get any decent photos, but never the less we had found our first herd and our spirits where up. We slowly wandered from group to group following their calls waiting patiently for the right moment to capture a deer standing in a beam of light or compose a silhouette of one with a clean back ground. In one thicket we managed to get some lovely shots of a large stag walking towards us in very thick ferns with only his head sticking out. He was not fazed by us at all and we had to move out of his way to avoid being on the receiving end of a very large set of antlers. He walked passed us and took out his frustration on a low lying branch before running down the hill towards a group of hinds in a small valley below. As the sun and temperature rose, the deer moved out into the open fields where they lay sunning themselves and the males continued to call to any female looking for a harem to join. In the distance we witnessed a fight between 2 rival stags with a group of 7 females watching intensively to see which male would be the more dominant. We raced off in their direction to record the action, but unfortunately by the time we reached them, there was already a winner who had kept custody of his females and the challenger was seen running off into the distance. It was a good day out and we got some good images. The light was a bit dark early in the morning, but the sun eventually showed itself and we could lower those ISOs enough to get some clean images. If you are interested in photographing in Richmond Park, I would recommend getting an early start as you have a good chance of getting some lovely silhouette images of deer in thick mist. The deer tended to stick to the woods in the morning and move into the open areas as the day warmed up. At this time of year it is very easy to locate the deer by their calls. I would definitely recommend a large focal length lens around 200 to 400mm as you don’t want to disturb them or get too close as they can be aggressive and have been known to attack people. A monopod or tripod is a must, I found myself shooting at around ISO800 and only getting shutter speeds of 125th of a second at f5.6 and f8. I always take great delight in taking time out from looking through the eye piece of the camera and just appreciate being amongst nature, spending time with these magnificent animals and enjoying the moment you have together. Last but not least…respect the wildlife in our parks, take only photos and leave only foot prints. Posted 9 years, 6 months ago at 1:29 pm.